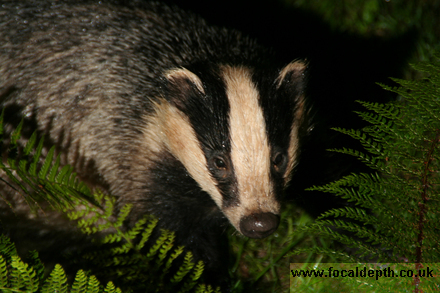 FocalDepth Portfolio Europen Badger in ferns at night. Wildlife - Europen Badger in ferns at night. Europen Badger in ferns at night. Europen Badger in ferns at night. Europen or Eurasian Badger hiding in ferns at night. The general hue of its fur is grey above and black on the under parts with a distinctive black and white striped face and white-tipped ears. European badgers are around 70 cm long with a tail of about 20 cm and weigh 10 kg on average, but weights can vary enormously. Badgers do not hibernate, although in areas with cold winter climates they may become torpid for two or so days at a time having put on fat in the autumn to help them get through the winter months. In parts of Russia, badgers have been reported to weigh up to 42 kg (92.5 lb) in the autumn.